The precision of our ADC depends on the number of levels of quantization. Higher the bits of ADC more is the resolution. Keep in mind for the given voltage, you don’t get voltage again. you get a number. That number will be your digital value. Also you can use your ADC till 8 bit also, by taking down the resolution. Read further to know how. As you can see there are total 8 Analog pins. But we said earlier that there is only channel then how? Well they all are multiplexed internally to that channel. Nice isnt it? Also for supply and noise immunity ADC has seperate Supply and Ground. The ground should be made common at only single point for reference grounding. 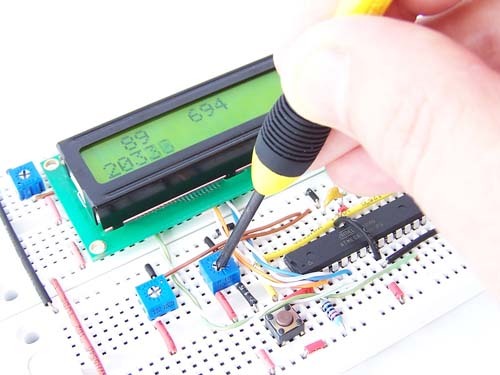 ADMUX is for Adjusting reference voltage and choosing the channel. ADCSRA is for configuraing enabling and starting conversion. ADMUX has first 2 bits For adjusting reference voltages. Here is chart. Choose as per your requirement. Here we will put it 01/ ADLAR is for Left or right adjusting. We will see its application later. ADSC starts conversion, this should be enabled in program operation. ADIF is flag which tells us if the conversion is done, After starting the conversion we need to wait till this flag is set. then only take the result out otherwise it will give us wrong result. ADPS are the prescalers. Ideal Value for Frequency is 250khz, so if your clock is too high do the math. ADCH and ADCL are the registers which will hold our results for conversions. As we can see in this chart the ADLAR will decide the way the result can be hold. You can change the channels by adjusting ADMUX in program. That’s all for ADC. Use it for your sensors or anything. Checkout our Skateboard Hand gestured posts code to see how we have utilized analog value from Accelerometer as a proof of concept. 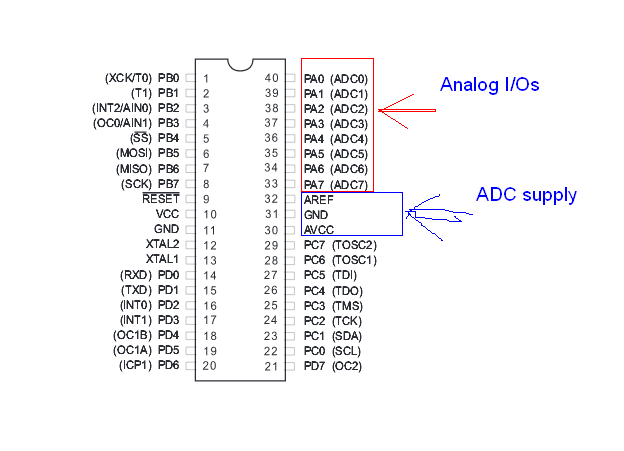 This entry was posted on December 14, 2013 by S4t4n in Tutorial and tagged ADC, Analog to Digital Converter, Atmega16.